Helsinki is a cost-competitive location for research and development activities in ICT, compared with most European cities. The capital city of Finland attracts foreign companies and investors with its innovation ecosystem and abundance of tech talent at the Helsinki Business Hub. Talk of Finland will certainly make you think of Nokia, the former crown jewel of the north-eastern corner of the European Union. The decline of the mobile phone giant is, ironically, good news for other companies seeking world-class ICT know-how. The ex-Nokia employees are now at your service - among other specialists. You get a lot for your money there, too. When comparing the business costs of 11 European software development locations, Helsinki turned out to have the third-lowest operating costs, leaving cities such as Amsterdam, Paris and Stockholm behind. Annual operating costs in Helsinki are 5% lower than the average in major European cities with comparable ICT know-how available. Furthermore, Helsinki has the fourth-lowest labour costs of the 11 European top ICT centres, based on information received from the fDi Benchmark database. In analysing the competitiveness of ICT locations, this cost model combines the key inputs of labour and property. It is, however, not only modest costs that have made the world have a closer look at Helsinki. There is something special in the city: people. "Helsinki's strength is definitely the great number of skilled ICT professionals. Especially with the current restructuring of the ICT sector, there is a large pool of talent available," says Marja-Liisa Niinikoski, CEO of Helsinki Business Hub, the regional development agency. A recent skills audit of the Helsinki region revealed 116,000 people with technical ICT skills live in the area. The majority of these professionals come with advanced programming skills. You are sure to find not only Java, html, Android or Oracle experts, but also those with less uncommon programming skills. The Finnish capital nourishes a blend of experience and new talent. Over 60% of the ICT professionals in the area have more than five years of working experience and 82% of them hold at least a bachelor's degree. A fair number of newcomers graduate from science and technology annually. The ICT innovation ecosystem in Helsinki is diversified; it brings together companies, research institutes and universities. Aalto University, Helsinki Institute for Information Technology (HIIT) and the Finnish node of the European Institute of Innovation and Technology (EIT) provide the ecosystem with the freshest scientific knowledge. "ICT and digitalisation are fundamental competence areas at Aalto University. In particular big data, data analytics, games and security gain constant international recognition. Digital health, energy efficiency and industrial internet have emerged as key application areas for our digi-competence," says Seppo Laukkanen, associate vice-president at Aalto University. "International comparisons point out that Aalto University has an exceptionally active and versatile innovation ecosystem where our faculty, students and partners work transparently together. World-class competence and close collaboration with great partners give a strong foundation to develop solutions to the grand challenges of our society." 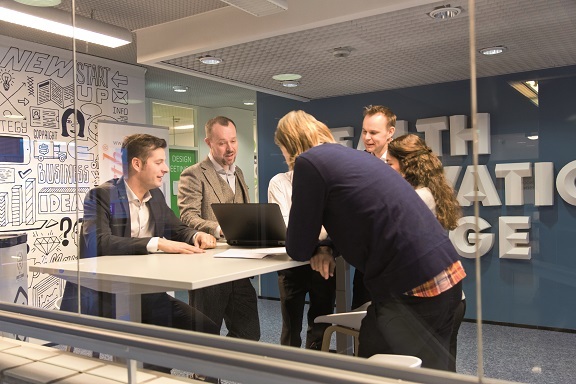 Currently, 4,000 companies specialise in ICT in the Helsinki metropolitan area. However, there is room for more and help will be on hand if one wishes to explore business opportunities in the region. "Helsinki is the home of innovation," Niinikoski advises. "What we do best at Helsinki Business Hub is match supply and demand. So let us know when you want to come for a visit and we'll introduce you to the relevant players." ICT expertise is put to use in Helsinki.